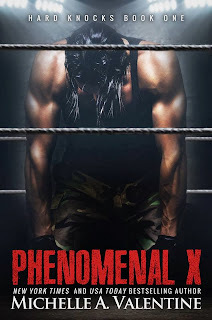 I love Michelle Valentine's Black Falcon rock band romance series and I have a feeling I am going to love Phenomenal X. Xavier Cold looks like he's going to be a rock star in the wrestling ring. Check out the Phenomenal X cover and synopsis. I cant wait to read this one. From the mean streets of Detroit rises the newest superstar of professional wrestling, Xavier Cold, better known as Phenomenal X. His muscular physique makes men cower before him and woman lose their minds with desire. Anna Cortez is fresh out of college and naive to the harsh realities of the real world. Tired of living under the thumb of her conservative family, she defies them when she accepts a job as the assistant to wrestling’s most notorious bad-boy. Phenomenal X has an animalistic nature that even good girl Anna finds hard to resist. One night forced to share a bed in a sold-out hotel, lines blur between them and they quickly learn that one lustful night changes everything and neither one of them will ever be the same. Damn my stupid curious brain. That just set him up for all kinds of more dirty talk.